Recently published studies on diversifying the conventional corn-soybean rotation across the Midwest have made a splash in national media. The 10-year experiment is finding that adding small grains, red clover and/or alfalfa to our farming systems can greatly reduce the need for fossil fuels, chemicals and synthetic fertilizers, without sacrificing yields or profitability. Below you’ll find answers to some frequently asked questions about the long-term study, which has received grants from the Leopold Center, the USDA National Research Initiative, the Iowa Soybean Association, and the Organic Center. What are the rotations in the experiment and how are they managed? The research includes 13 years of data collected from research plots at the ISU Marsden Farm. It compares a 2-year conventional corn-soybean rotation with more diverse cropping systems: a 3-year rotation of corn, soybean and small grain/red clover, and a 4-year rotation of corn, soybean, small grain/alfalfa and a fourth year of alfalfa. The longer rotations received clover and alfalfa residues and composted cattle manure from nearby farms; synthetic nitrogen was applied only as needed. Herbicides were applied in the longer rotations during the corn and soybean years in 15-inch bands rather than broadcast spraying, and inter-row areas were cultivated. How was the experiment set up? Nine experimental plots were replicated four times (a total of 36 small plots, each 18 by 85 meters). Each plot was randomly assigned to one of the three rotations. Over the course of two, three or four years, the plot was planted with each crop in the assigned rotation. For experimental purposes, the plots were arranged so that every phase of every rotation would be present every year. What were the tillage practices in the experiment? Tillage regimes differed among rotation systems. In the 2-year rotation, a combination of fall chisel plowing and spring field cultivation was used between corn harvest and soybean planting; spring field cultivation was used between soybean harvest and corn planting. In the 3-year system, a combination of fall chisel plowing and spring field cultivation was used between corn harvest and soybean planting; zero tillage or spring disking was used between soybean harvest and the planting of small grains and red clover; and fall moldboard plowing followed by spring disking and field cultivation were used to incorporate clover sod and prepare a seedbed for corn. Tillage practices in the 4-year system were the same as those in the 3-year system, except for a longer period without soil disturbance, from small grain and alfalfa establishment until alfalfa sod was fall moldboard plowed. Are these farming systems new? Low-input, more diverse crop rotation systems are new in the sense that they use modern technology and tools and a modern understanding of ecological systems, but the underlying concept is time-tested. Farms with more diverse products and practices generally are more resilient. They have a long history in practice, and also in science. Integrated crop-livestock systems were widespread in northern Europe, England and much of North America until the 1960s, when the availability of low-cost, synthetic fertilizer eliminated the need for diversity and encouraged farmers to specialize. Are they practical on a large scale? The study confirmed that 3- and 4-year rotations work at the farm scale or ‘micro-economic’ scale. It showed that these rotations are a practical solution for reaching multiple goals: reducing environmental impact and maintaining on-farm profitability. Diversifying food and agricultural systems, whether or not through these exact rotations, is a positive and realistic assumption for future large-scale agriculture. Understanding how diverse and integrated crop-livestock systems work on a regional scale would require macro-economic modeling that wasn’t part of this study. Policy, for example, is likely to continue to play an important role in farming decisions. Modeling in future research can track the complicated interactions among markets, policies, adoption, and goods. Could they work in every farm operation? Not necessarily. Diverse rotations require different skills and knowledge than the conventional corn-soybean system. Nevertheless, the study illustrates the concept that ecosystem services can be used to replace synthetic inputs, a principle that can be used to make small or large changes to any farm operation. The drivers that optimized the industrial food system are changing. New farming systems will emerge to address new concerns, among them the rising price of fossil fuels, chemical resistance in weeds and other pests, an unpredictable climate, and the quality and sustainability of rural livelihoods. The study shows that adding diversity to crop rotations can help meet the goal of reducing environmental impacts while maintaining farm profitability, but policy and market changes may be necessary to enable farmers to make these transitions. Why doesn't everyone just adopt these systems now? The price signals, market structures and policies do not exist that would drive a wholesale change in agricultural practices. These factors tend to hold the current system in place. Farmers often lack both the incentives and management skills to make changes to diversified and integrated systems. Additionally, the specific crops used in new systems will likely vary from region to region, depending on soil, climate and market. Historically, adoption of change follows a bell-shaped curve. The experiences of the early adopters pave the way for the next round of change. Small changes in policy could both jump-start and ease transition to these kinds of farming systems. Will these systems work in regions other than Iowa? The concept that regionally appropriate mixes of crops in diverse rotations can enhance ecosystem services and replace synthetic inputs is a principle that works across regions. This study focused on diversifying the 2-year corn-soybean system common in the Midwest. The experimental rotations included alfalfa and small grains, which may or may not be the most appropriate crops for other agricultural regions. Do these systems require more labor? Yes. The 2-year cropping system examined in the study had high fuel costs but required 33 percent less labor compared to the diverse rotations. In the 3- and 4-year rotations, energy costs plummeted but labor costs went up. In essence, the 3- and 4-year systems replaced fossil fuel energy with human labor and knowledge. An equally important labor consideration for farmers is timing of labor. If the increased need falls into a window between major corn and soybean activities, as it does with the 3- and 4-year rotations proposed here, it may be a reasonable and feasible use of existing labor. Do these systems require more land? The assumption of the experiment was that farmers could grow a range of different crops on their farms if they were appropriate for climate and soil conditions. 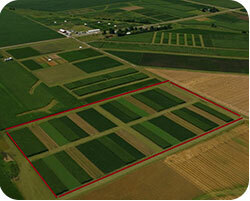 The researchers made comparisons among rotations on the basis of net returns to a unit of land split among crops in different ways, depending on the rotation system. Imagine a 600-acre farm. In the 2-year rotation, there would be 300 acres of corn and 300 acres of soybean in any given year. For the 3-year rotation, there would be 200 acres of corn, 200 acres of soybean, and 200 acres of oat with red clover. For the 4-year rotation, there would be 150 acres each of corn, soybean, oat with alfalfa, and established alfalfa. The study found that net returns for farms of the equal size were similar for all three rotations. Does this require an investment in new machinery? Pre-owned machinery could be used but machines for planting and harvesting small grains, like oats, and hay crops like alfalfa would be required. How do these systems work with genetically-modified (GM) seeds? The experiment compared both GM and non-GM corn hybrids and soybean varieties. Comparing within the 2-year rotation, GM seeds offered higher net returns than non-GM seeds. Comparing within the 3- and 4-year systems, farmers could choose between GM and non-GM seeds without jeopardizing net returns. In other words, diverse cropping rotations give producers more flexibility on their choice of seed technology package. Why integrate livestock with cropping systems? “Integration” can be on a farm or between farms, and is sometimes called “mixed” or “coupled” farming. Farming systems that integrate livestock and crops, especially ruminant livestock, tend to be more sustainable because they provide opportunities for rotation diversity to break disease and pest cycles, improve soil conditions (structure and productivity), reduce nutrient, soil and pesticide losses into water, and improve overall energy efficiency. For example, when crop/livestock operations are not coupled, manure may become a waste product and water pollutant. When operations are coupled, manure can be used in the cropping system to save money and enrich the soil. As another example, the alfalfa and small grains in the diverse rotations provide forage for livestock, while the livestock in turn, supply manure for land application. Would adding livestock require a big investment in infrastructure? What about lack of knowledge among specialized producers? Skills, interest and infrastructure vary from farmer to farmer and region to region. Integrating livestock and crops could occur in many forms, maybe on-farm, but also between farms. Innovative service companies and creative lease and sharing contracts could be explored as transition tools, providing resources and time for producers to make changes and design systems that fit with their land, neighbors, equipment and knowledge. Why is manure better than synthetic fertilizer? Manure is a biologically active substance; synthetic fertilizer is not. This is important because soil itself is a living construct, with millions and millions of living organisms in every square inch. Soil life interacts differently and more positively with manure than with synthetic fertilizer. By applying manure, farmers can encourage the development of healthy soil that provides critical functions such as removing pollutants from water, managing water flow, providing habitat for roots and micro-organisms that are key operators in greenhouse gas cycles. Of course, it is possible to apply manure in excess quantities and overwhelm the soil’s ability to assimilate it in a healthy manner. Is it dangerous to apply manure to land? No, but there are management and handling guidelines that should be followed. Animal manure that is not managed and applied correctly can be a reservoir for undesirable bacteria and other pathogens, a breeding ground for flies and insects, and can contribute to water pollution. Most soil amendments have handling guidelines. They differ depending on the product being used. For example, a popular source of nitrogen source in agriculture is anhydrous ammonia, which can be directly hazardous to human health and can carry the risk of water contamination. Do diverse rotations really use less fossil fuel? The study found that the diverse rotations required approximately half as much fossil fuel energy compared to the conventional two-year system. Energy inputs were calculated for five categories: seed, fertilizer, pesticides, fuel for field operations, and propane and electricity used for drying maize grain after harvest. The primary energy input in the two-year rotation was nitrogen fertilizer for corn, whereas fuel for field operations was the dominant category for the diversified rotations. Are pesticides, herbicides and synthetic fertilizers really a problem for people and the environment? Why not simply use chemicals to control weeds? Heavy reliance upon herbicides for weed control threatens the health of non-target organisms and results in weed evolution of herbicide resistance in agricultural systems worldwide. A chemical-intensive weed management strategy may seem cost-effective in the short term, but this is largely because the environmental, health and long-term resistance management issues have been treated as externalities, rather than being explicitly accounted for in the economics of the farming system. In the research project, the use of crop and rotation diversity enabled producers to use 88 percent less herbicide than the corn-soybean rotation to achieve the desired weed control and reach yield goals. This reduction in chemical use, coupled with some physical controls, like cultivation, and ecological controls, like crop diversity, will allow chemical tactics to continue to be effective further into the future. The diversified, multi-tactic weed management strategies used in the 3-year and 4-year systems are not widely used in the Corn Belt, but are employed on some commercial farms, and have been identified as examples of what is necessary to address the growing problem of herbicide-resistant weeds. Mortensen et al. 2012 Navigating a critical juncture for sustainable weed management, BioScience 62:75-84. Powles SB, Yu Q, 2010 Evolution in action: plants resistant to herbicides. Ann Rev Plant Biol 61: 317–347. Why not just use no-till farming? Zero tillage (no-till) can be an important component of soil conservation but it also requires greater reliance on herbicides. Farming systems that integrate physical (e.g., cultivation) and cultural (e.g., diverse rotation) weed control tactics, both with and without herbicides, are effective at breaking weed and pest cycles and greatly decrease environmental toxicity. Why not go completely organic? Organic systems take advantage of the same ecological processes as the diverse rotations examined in this study, but use no synthetic chemicals. Organic crops have the advantage of premium prices on the market, but require much higher degrees of management skill and often labor. A common misconception about organic is that it guarantees that sustainable practices are used, when it does not. Well-managed organic is productive, ecologically-based and profitable: it has a place, but is not a one-size-fits-all answer. Diverse rotations managed with low levels of agrichemicals offer a middle ground that may be easier for conventional corn and soybean producers to adopt. Small amounts of chemicals can be used strategically to fine-tune the system and close any yield gaps that might exist. Ultimately, an array of farming systems will be required to address human and environmental needs into the future. How did you calculate yields? Yields were determined by harvesting the entire plots for small grains and alfalfa, harvesting sample areas from the center of corn and soybean plots, weighing seeds, hay, and straw and adjusting for moisture content. Yield results are presented in the study on an annual basis. In the Davis et al study, which used data from 2003 to 2011, an average corn year for the diverse rotations had four percent greater yield than the two-year rotation. An average soybean year was nine percent greater. How did you calculate profits? The study shows net returns to land and management, which represent profits to a farm operation without accounting for land costs, management time, and possible federal subsidies. There were no statistical differences among the three cropping systems for either the “startup” (2003-2005) or “established” (2006-2011) phase of the study. The researchers included the costs of labor and machinery for spreading manure, but assumed that the material itself would be obtained from on-farm livestock or from neighboring farms at no cost. Iowa market year crop prices were obtained from the USDA National Agricultural Statistics Service, and gross revenue was calculated for each plot in each year as the product of crop price and yield. Aren't you producing less corn and soybean over the long run? Yes. Corn and soybean are grown less frequently in the diverse rotations compared to the two-year rotation, even though yields when and where corn and soybean are grown are bit higher. Would this create world food shortages? Corn and soybean have a relatively small contribution to direct human consumption. There is a widespread belief that only corn and soybean have only food or market value. That is untrue, especially from the standpoint of global food security, considering that only a small fraction of U.S. corn and soybean exports make it to food insecure countries (Olmstead 2011; http://www.iatp.org/documents/feeding-the-world), and given the feed value of small grains like oats and hay. The important point is that all the crops in the diverse rotations have food and market value. If everyone adopts this isn't there going to be huge negative economic reactions? If the alternative cropping systems used in this study were widely and suddenly implemented there would be economic shocks throughout the system. Changes in amount and location of livestock (particularly cattle), type of infrastructure, and other factors would all likely occur and result in complex feedback loops and other shocks. If the amount of land used for oat and alfalfa production increased at the same time as corn and soybean production was reduced, then oat and alfalfa prices would likely decrease and corn and soybean prices would likely increase. The profitability of the cropping systems would change. A new equilibrium would arise between the amounts supplied and demanded for the various crops. How farmers would react to this sudden shift in profitability depends upon whether society feels the change meets its environmental goals. If the answer is yes, then a set of policies would be implemented to compensate farmers for attaining the goals set by society. This would be no different than paying landowners to put highly erodible cropland into grass cover for 10 years (i.e., the Conservation Reserve Program) or allowing farmers to receive different payments based on the field operations and rotations implemented on their land (i.e., the Conservation Security Program). If the answer is no, cropping patterns would change as farmers react to profit signals. What about the demand for ethanol? While corn is currently an attractive biofuel crop, the primary use of corn-based ethanol is in blended gasoline. In 2010 U.S. ethanol consumption approached the legal blending limit of 10 percent (recently increased to 15 percent for newer vehicles). There is now a large unused stockpile of ethanol, according to data from the U.S. Department of Energy – Energy Information Administration (EIA). The EIA predicts a slow increase in ethanol consumption that will level off in 2020, with much larger increases in “second generation” cellulosic biofuels such as switchgrass. Similar trends are predicted for soybean oil in the biodiesel industry. Thus agricultural systems in the near future are likely to diversify into second-generation crops to meet biofuel demands. For more information, see Annual Energy Outlook 2012 at www.eia.gov. Are there markets for alfalfa and small grains? Alfalfa and small grains could be marketed as forage or feed for livestock, used as forage or feed for on-farm livestock, marketed for food, fiber and energy, or used for green manures. More market opportunities would have to develop for widespread adoption of diverse rotations. Currently, alfalfa and small grains are a good way to save money, rather than make money, because they enable a large reduction in synthetic inputs. The researchers also found that diversity stabilized profits from year to year, an important consideration as fossil fuel costs rise. Don't farmers make more money with corn and soybean because of government subsidies? The study found that net returns were comparable for all the rotations studies; however, the net returns were calculated without considering possible federal subsidies. Policy programs are important drivers for producer profitability assessments, reducing financial risk and directly influencing farmer cropping choices. Five commodity cropping systems are generally favored by these programs, including corn and soybean. During the course of this research, the subsidy programs were replaced with a new system of crop insurance. The policy – profitability trade-off is a completely different kind of research question, which the research team is now considering. Diverse rotations remain an attractive option for producers concerned about environmental externalities and the long-term health of their cropland. Ultimately policy changes may be required to properly account for the costs to society of environmental and human health impacts and enable farmers to switch to more sustainable systems without losing the financial benefit of taxpayer support. Government subsidies take several different forms when it comes to the Farm Bill. Currently, farmers producing program crops (corn, soybean, oats, wheat, and others not including alfalfa) receive a "direct payment" which is based on a formula using what they have planted in the past. The payment is de-coupled in that it is the same regardless of what is currently planted or what yield is received. It is likely this direct payment will be removed from the next farm bill. A secondary payment in the current Farm Bill is a "counter-cyclical" payment which is based on what is planted and is triggered when prices go below a certain threshold. The third payment that farmers can receive is a "deficiency payment" which occurs when prices fall below the county loan rate. Because of the level of prices for corn, soybeans, and the other program crops, these latter two payments have not been made. In summary, no price supports are received based on what is produced and the only payment received by farmers is the "direct payment" which would be the same regardless of what is planted. Because the payment is the same per acre regardless of the rotation implemented, these subsidy payments were not included in the analysis. The effect of inclusion would be to simply increase all gross revenues by the same amount per acre regardless of crop planted. Farmers pay for crop insurance, which is subsidized by the federal government. There are numerous crop insurance products with payments that are based on yields and others that are based on revenues. The levels of insurance cover a range of 60-90% of proven yields. There are also insurance products based on whole enterprises, whole farm, and county-based programs. Corn, soybeans, and oats are all insurable through this federal crop insurance program; alfalfa is not. Average yields have consistently been above insurance thresholds and therefore not affecting gross revenues. We may need to revisit this as we move forward with the study and yields become a little more extreme. Liebman, M. 2015. Diversified cropping can balance productivity, profitability and environmental health. Resource: Engineering & Technology for a Sustainable World 22:3 (20-21). Published by the American Society of Agricultural and Biological Engineers. Economic Analysis of Three Iowa Rotations, Sept. 2008, ISU Extension publication comparing the economics of conventional, diverse and organic rotations.